Principal of Optimum Designs Ltd Deshon Fox returned to his native Bahamas to seek out opportunities, landing contracts with Baha Mar and KPMG Advisory Services Ltd. Principal of engineering firm Optimum Designs Ltd, 36-year-old Deshon Fox is one of a new breed of Bahamian entrepreneurs that is realizing potential in their homeland. After graduating from Florida International University in 2000 with a Bachelor’s degree in civil engineering, Deshon returned home to work in the office of George V Cox as a structural analyst. A year later, he moved on to the office of Basil McIntosh for a brief stint working as a structural analyst before beginning post graduate engineering studies at the University of Minnesota. In 2004, Fox graduated from with a Master’s degree in civil engineering. Closely following this, he accepted a position at Kimley-Horn and Associates, a top multi-disciplinary engineering consulting firm with offices throughout the US. Fox worked for three years at its Vero Beach office in Florida. At Kimley-Horn, Deshon honed his engineering skills. He worked alongside leading professionals within a variety of engineering disciplines including engineering feasibility and site analysis, traffic analysis, market analysis and economic feasibility, environmental site assessments, storm water management, roads and drainage design, potable water distribution and wastewater collection and treatment. “Kimley-Horn was a rigorous environment. The performance expectations were high. Only the best survived,” Fox says. Though challenging, he credits his time at Kimley-Horn with driving home to him the importance of efficiency in the engineering profession. 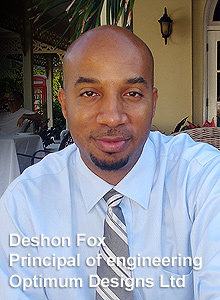 In 2007, Fox returned home to The Bahamas, accepting a senior engineer position at Integrated Building Services (IBS). In 2010, at the height of the economic crises, Fox decided to move on from IBS to form Optimum Designs Ltd, a multi-disciplinary engineering consultancy firm. Despite the economic slow down, Fox was encouraged by the start of major developments and infrastructural works such as Baha Mar and the Airport Gateway Project. He knew that many developers, both local and foreign, were in the hunt for dependable, professional engineering service. He was determined to make Optimum Designs the number one choice of discriminating clients. Within a year of forming the company, Fox was engaged by leading corporations such as KPMG Advisory Services Ltd and became an instrumental player on major projects such as the Baha Mar mega-resort development and the Princess Margaret Hospital expansion. Cabinet ministers and high-ranking representatives from Customs, Labour, Finance and other government departments and agencies will be on hand when the Ministry of Finance hosts its first ever E-government and Business Forum in Nassau tomorrow. Chairman of the Grand Bahama Port Authority Ian Fair has outlined a series of significant business openings on Grand Bahama this year.